Though I now think differently about the phrase “an apple a day will keep the doctor away” after reading Michael Pollan’s The Botany of Desire, I’m still a big fan of apples and likely eat close to an apple a day anyway. And, honeycrisp apples have become a favorite splurge this year. My husband and I will occasionally buy one and split it since they’re so massive. These fantastic apples inspired the most recent pattern released by Mari of Disparate Disciplines, the Honeycrisp Mittens, and I was lucky enough to be asked to help test the pattern before it was released into the wild. When the pdf pattern arrived in my inbox, I read through the suggested fabric guidelines of “medium to heavy weight knits with 30% stretch” and began plotting my fabric choice based on what I had in my stash. I was hoping to use some old sweaters I’d saved for just such a purpose, but I realized that the box they were in was tucked too far back into our storage closet for me to reach. I gave up on trying to get to it since I can’t seem to lift or move much these days thanks to the baby belly! Next, I started thinking sweater knit and wool jersey. I had just received some of the latter from Mood Fabrics for my January MSN project, but I couldn’t bear to cut into it before I’d made sure I had enough to finish my actual garment. Finally, I turned to my scrap pile, and I found my answer right on the top. The leftover bits of silk jersey from my most recent twist dress would keep me decently insulated while also being super fancy. And, though they look demure when paired with my red jacket above, I decided to take advantage of their potential for super fancy by making them into arm-length mittens. Ta da! Super fancy, super awesome mittens to keep me warm when wearing sleeveless dresses this holiday season. I was pleasantly surprised with how the taupe background blended in with my skin, giving the appearance of black rings tattooed all over my arms. I wish I had enough of this silk jersey left over for leggings as well! The mittens have a unique design that uses separate pieces for the front and back of the hand that twist together just below the palm to form one seam down the inside of the arm. 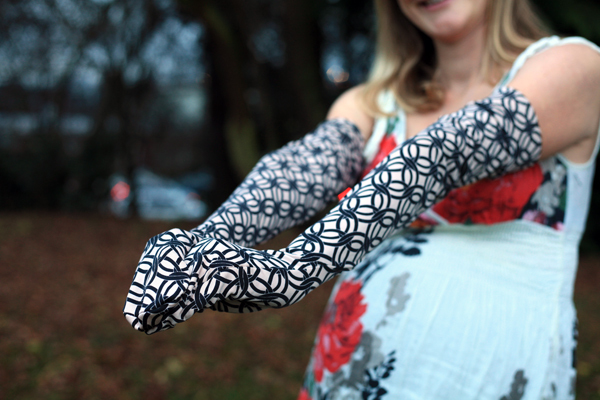 The seaming gets a bit lost in my busy print, but you can see it if you look hard enough! The pattern instructions kindly show you exactly how to sew this complicated seam in one fell swoop. Honestly, these mittens come together in minutes. 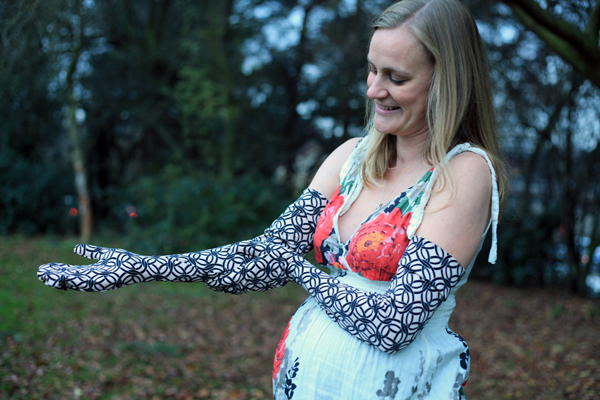 The best part is that they have the option for using conductive fabric at the finger tips so you can use your fancy touch-screen devices without needing to take off the mittens! I didn’t have time to grab conductive fabric while testing the pattern, but some is currently on the way as a thank you for pattern testing from Mari. She has both black and gray available. I can’t wait to try it out when I make my next pairs! The pattern comes in XS to 3XL. It took me longer to figure out how to grade the pattern between my long fingers, which required an L length, and my skinny little wrists, which required an S width, than it did to both cut and sew these mittens together. Figuring out the grading is totally manageable though, and it means you can make custom mittens for anyone if you know just a few of their hand measurements. Hello quick and easy holiday presents! Mari has put together an awesome blog hop all week long to show off different versions of the Honeycrisp Mittens. I recommend you check them all out! Gillian, Winnie, and Liz made the elbow length mittens, Brooke made the wrist-length mittens, and Rhonda and I made the full-arm mittens, so you can get a feel for all three lengths that come with the pattern. Winnie also tested the conductive-fabric pattern option when she lined her second pair. And, I have to say that I second Winnie’s feeling that the longest version of the mittens, the ones I made here, would be great for running. It often helps to have an extra layer on your arms when you begin a run on a chilly morning, and these long mittens would provide warmth for your hands and your entire arms. Once you’ve warmed up, you can either push the arms down or pull off the mittens entirely. I even mentioned this idea to Mari in my feedback since it seems to me she’s always making patterns that are secretly perfect for runners (see my take on her Avocado hoodies)! Thanks Mari! What a neat pattern! Your mittens turned out great! 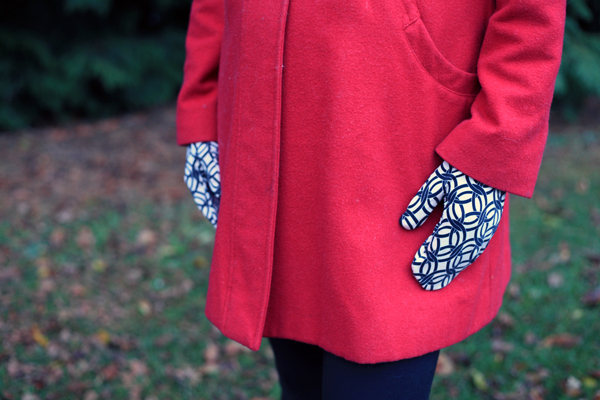 Fun fun fun mittens with the bold print in the long-length! And yay for other girls with long hands and skinny wrists (so glad I’m not the only one)! How ridiculously awesome are those mittens?! Love the print, love the extra-long length, love the baby bump, too 🙂 Since you used to live in my area, you can appreciate how much I need those right now, with our expected high today in the low 50s! Enjoy! 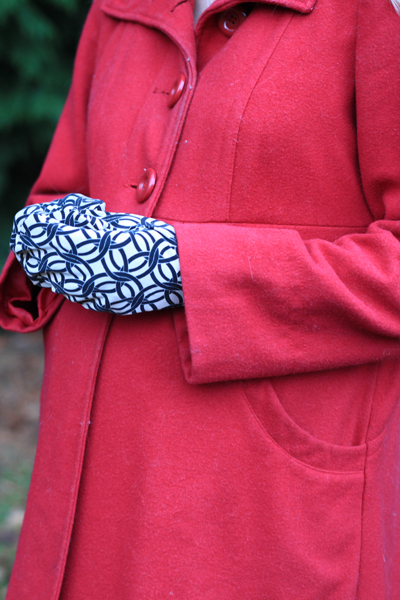 It’s so great to see you full length mitts & in such awesome fabric too. I love how you’ve caught that tattoo look 🙂 but with an evening length glamour!! And that you’ve graded them so successfully is brilliant, a sign that the measurements Mari gives for the whole hand, arm & fingers are the right ones to get a great fit. I like your support of running arms too!! Those are super cute, Amy!